Usually enriching refers to adding butter (often to a sauce or a stew) but I prefer to add nutrients. I also dislike waste. So whenever I have leftover veggie scraps, I pop them into a container in the freezer. 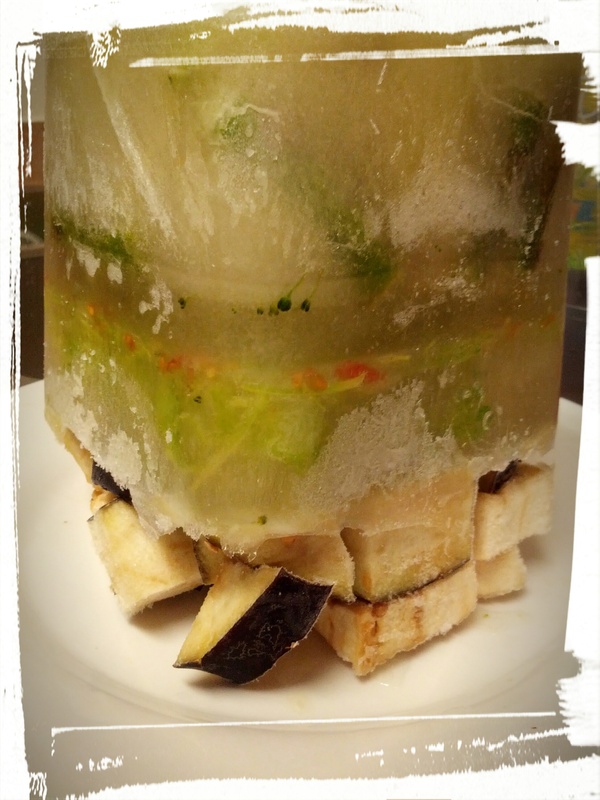 And if I’m steaming or boiling veggies, I save the nutrient-rich water by pouring it over the frozen veggie scraps, and then popping the container back in the freezer. Once the container is full, I toss it in with a leeeetle bit of water, and boil the heck out of it. Then I get rid of the veggie solids, and use the remaining super-enriched-with-nutrients broth as the starting point for a soup or stew. And that’s how we get to today’s recipe, Hearty Meat and Potato Soup! It’s like eating a meat-and-two-veg plate, but in soup form. Think BBQ’d hamburger with a side of potatoes and green beans. With a saucy sort of gravy. And then inject it with nutrients and call it a soup. Want some? Dump it in a pot. Boil it up, until the potatoes are cooked through, and the noodles are soft. That’s it! Serve and enjoy the raves about the flavour! Honestly, this is a super-tasty soup. I made it tonight, as I’m prepping meals for the week ahead, but wish it was time for dinner. I usually eat Greek yoghurt for supper (I have IBS issues and Greek Yoghurt for dinner works for me), but I’m looking forward to eating this tomorrow night instead! I think the reason the soup tastes so good is due in great part to the type of hamburger I used — the gardein beefless burger seems to have a whiff of smokey flavour, and that really makes the dish. Like tree rings, only for dinner. And the veggie stock I talked about? This is the base for my Kitchen Sink Soup. Which is basically, dump all frozen leftover veggies and veggie water in a pot, add in whatever leftovers are in the fridge, some noodles and rice and beans or what have you, and serve it up with some fresh bread and butter. Easy, economical, and healthy. Also, it’s never the same soup twice, which I love and the DH hates. But ha!ha! I cook, so I decide. Mwahaha! She who holds the ladle rules the world. Next Post: More jelly, less waste! And wine. Always with the wine. 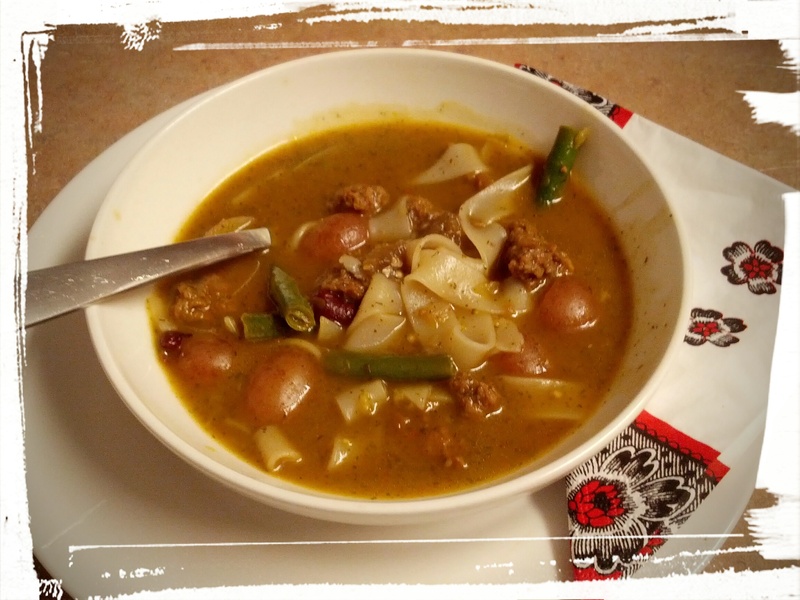 This entry was posted in Soups, Vegetarian Main Dishes, Waste Not Want Not on November 3, 2014 by Margaret.